On the bottom row, kneeling is Julie, redhead Emily (they're sisters and best friends), Joan and Pam. Back row is Kathryn (Julie and Emily's mom), Karen, Donna (popping her head around Karen’s shoulder), Sonja, Jackie, Myrtle and kneeling behind Pam is Leah. 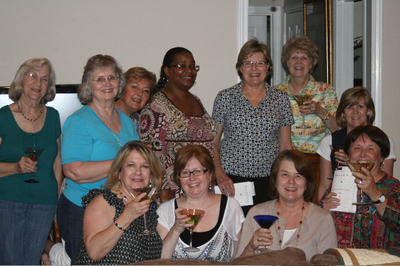 This book club has been meeting since October '02 in Plano, TX in each other's homes. Initially, they were a neighborhood book club, but then more members were brought in. Emily’s sister, Julie, named them the "Cover Girls" and they seem to have it down: Whoever chooses the book, looks up background information on the author, including how he or she came to write the book, as well as gets discussion questions together. Very organized, ladies! But, don't think this means this club doesn't have fun: They assured me their Queenly meeting featured a "giant pitcher of apple martinis." Maybe all those martinis are why Emily emailed me this afterwards: When we got off the phone we all looked at each other in amazement over how much fun it was talking to you and what a sweetheart you are. Oy, Emily. Way to ruin my reputation! Many, many thanks to the Cover Girls for a most enjoyable discussion! This page contains a single entry from the blog posted on July 11, 2010 6:54 PM. The previous post in this blog was Thirsty Thursday Girls. The next post in this blog is LOOOOONG Running Book Club.